LIVING IN THE HALLWAY OF TIME. We’re always passing through time, living our actual life in a hallway that connects a remembered yesterday with an anticipated tomorrow. You could say we’re in the importing and exporting business – we import yesterdays’ experience into todays’, and export that repeated experience with our notions about tomorrow. That is, no matter where we actually are, we’re always compulsively living somewhere else in our head…in our minds’ ideas about what’s going on! We’re constantly in transit – in time – in the connecting halls between old ways of thinking and feeling, between mind-made “experiences” of reality. In Venice, Italy, there’s a famous, elegantly arching, carved stone bridge that connects the 12th.century city hall and courtroom (the Ducal Palace, at left in picture) with the ancient prisons (at right) For centuries, thousands of the newly condemned passed across this bridge, catching their last glimpses of sunshine and freedom before entering into those deep, dark and damp prison cells. 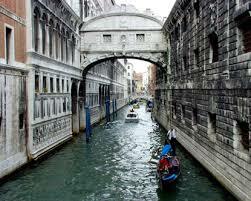 It’s called “the Bridge of Sighs” and not without reason. And it’s symbolic today of how most of us live in our personal over-arching minds – suspended somewhere between a fragmented yesterday and a feared tomorrow. In our thoughts and feelings about yesterday, we contemplate a vague tomorrow. And that habitual and conditioned mind-set is always in motion, in anticipation – it’s a life lived on-the-run because it’s always about something else other than what is. We’re angry about this, worried about that, and almost never engaged in the only life we actually have – this alive here-and-nowness. This apparent life-of-the-mind rarely touches reality because it has no real connection. It’s all ideas-about-ideas. Its over-arching theme is always about the old “me” and a reality we think we know, and about its perpetuation. It’s a constant manipulation of experience based on what happened (which is stored in fragments, in memory) and what could or should, happen (which too is projected from memory) Our composed and pre-disposed daily“experience” is rarely new and fresh; our mind-view paints the same portrait of the life we think we’re living day after tedious day. In truth, all this living of a supposed life in the hallway is not only cramped and confined – it’s imagined! For life itself – no matter how or what we think of it – is actually only ever lived in the living present. And we move out of the hallway into the spaciousness of Now when we simply see our minds’ activity for what it is – imagination. We see in this moment (and only in this moment) that the mind is the writer of the fictional “me” and “you”. We perceive rather than conceive the world as it is. And we come into our inheritance –an infinite reality freed of our former personal and preferred “reality.” We abandon in an instant, all the notions of a separate and isolated “me” and re-join ( the word “re-ligion” means to re-join) the reality we in truth, never actually left.